Did Pets Trust Pass? ~ Pawsitively Humane, Inc. Thanks primarily to Michael Rosenberg, Lindsay and Rita for launching and spearheading the issue, and who met nonstop with county commissioners in the beginning; then the countless volunteers who posted and cross posted updates on social media daily, and handed out palm cards to remind voters to vote YES on #240. So much heart, sweat and tears were invested in this campaign. And it paid off!!! It was a phenomenal campaign won with bare bones funding compared to the Children's Trust that raised $20 million to win a similar election. And now the country is watching, hoping to implement a Pets Trust in their county to make a difference.The pressure is on. While the Pets Trust won majority voter approval, county commissioners still have the last word. Yes, it's never simple. And if you're familiar with our county process, things move slowly, too slowly in our opinion. The Pets Trust team has already drafted a plan and distributed it to experts nationwide for their input. Once this National Advisory Board has offered suggestions, improvements and validated the plan, Pets Trust team will present it to the county commission. This next part is important. If the county commission delays proceedings, we will need your help to pound them with emails to urge them to get on track! It will take time to implement programs to save these healthy pets from euthanasia and build new clinics and so much more. We can't afford anymore legislative/political delays. Having sat in numerous sessions dealing with the Pets Trust issue, Christine can share with you the painstaking preambles and speeches that lead to delaying numerous county issues. Pawsitively Humane will always keep you updated. We ask you to PLEASE REGISTER your email with this website to the right. You will automatically receive an email with any updates. Current followers can tell you we do not inundate our readers with a barrage of postings or emails. No one likes daily emails. Pawsitively Humane recognizes and respects your time and inbox space. 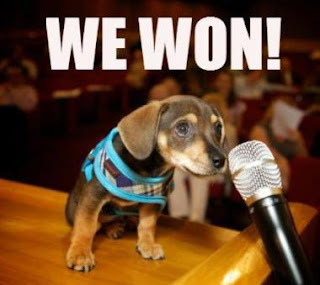 By the way, many people thought the photo of the puppy at the podium and microphone was photoshopped--NOT AT ALL. Christine was there when a volunteer was approached by homeless man selling the puppy right outside government center. Rita paid the man, took the puppy in her arms and charged right into the county session room and up to the podium for Pepe Sal to have his turn and speak for fellow pets. In the meantime, Pawsitively Humane, Inc. will continue its efforts to educate the public about responsible pet ownership, the need to spay/neuter, and what they can do to reverse the trend of unwanted pets from euthanization. Thank you for sharing this information and making a difference! Pets' Trust Miami is a citizens' initiative to improve animal welfare, increase adoptions and decrease overpopulation by providing free and low-cost spay/neuter, low-cost veterinary care and educational programs. Miami-Dade County Animal Services receives up to 37,000 dogs and cats each year and on average 20,000 of these adoptable animals are killed. More than 400,000 stray cats live on our streets. Pets' Trust Miami supports ballot #240, which proposes to address these issues with proven solutions.